Chile is one of South America's most stable and prosperous nations and has about 17 million inhabitants, of which 7 million live in its capital Santiago. Chile has a strong Catholic background, but over the last decades the evangelical church has grown rapidly and currently accounts for 15-20 percent of the population! The people are warm and loving, but there are also many physical and spiritual needs. The Chilean church is passionate for God, but its vision and support for world missions needs to mature to fulfil its sending potential. OM’s work began in Chile in the 1980’s through the visits of the Doulos and the old Logos. OM Chile was formally created shortly following the 1988 sinking of the Logos after hitting rocks in the Beagle Channel between Argentina and Chile. Mission Training & Experience: 9-month Intensive Missions Training (IMT) programme involving classroom teaching and real-world training in practical mission work to prepare participants for future long-term mission work. Equip churches and individuals for local evangelistic ministry. Short-term missions experiences (Adventure Teams, Exposure Teams) providing a mix of serving local churches and experience of our regular ministries. 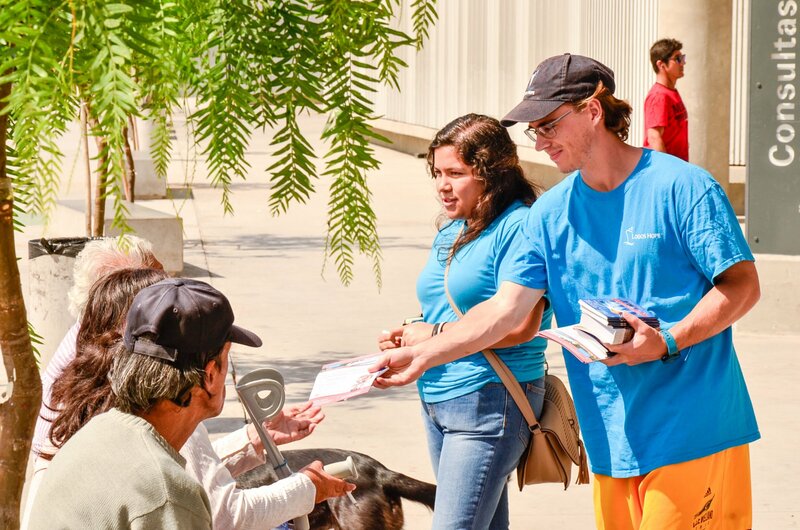 Mobilisation: Helping the churches of Chile engage with global missions through sharing opportunities to pray, give and go during church visits and conferences. Missionary Breakfasts: Free breakfasts every third Saturday of the month promoting world missions through testimony and presentation of missionary organisations and initiatives in Chile and worldwide. Books: Distributing low cost books to churches and individuals to help disciple, challenge and mobilise believers in the Great Comission. Evangelistic Ministries: Proyecto’s RUBI & VIDA: Working with children & teens at social risk living in children homes around Santiago through weekly visits designed to give them a renewed sense of self-worth and identity. Agapé Santiago: Working with the homeless of Santiago through regular visits to a day centre and a monthly ‘Cena de Amor’ - a cooked, sit down meal in the street for 80-100 people. Guerilla Evangelismo: Showing and presenting the love of God through creative and artistic evangelism in the Plaza’s of Santiago. Give — Give here (http://www.om.org/en/give) to help support the work of OM in Chile. Population: Population: 17, 134,708 Annual Growth: 1.01%, Area: 756,626 sq km, Capital: Santiago. State of Economy: While Chile is considere done of the most stable and prosperous Latin American countries the peso has lost 30% of its value since January 2013. While it has one of the lowest poverty rates in Latin America it also has one of the highest rates of income inequality resulting partly from disparity in education quality. Chile exports enclude fruit, wines, copper, timber fish and beef, with copper generating 20% of government revenue. GDP has risen steadily over the past 20 years and is now estimated at $23000 per person. State of the church: Chile has a strong Catholic background, but over recent decades the evangelical church has grown rapidly and now comprises 15-20% of the current population, providing a great potential for world missions. While the church has grown over recent years its vision in general has been focused on local church planting and lacked a vision for world mission. With the help and support of mission organisations churches are increasingly opening themselves up to this vision.